What is a Solitaire Setting? 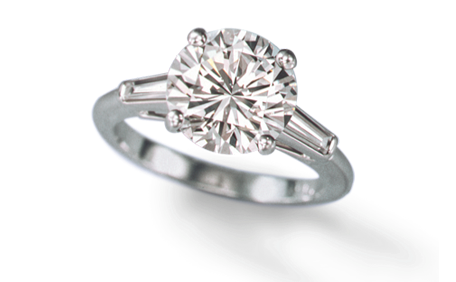 A diamond solitaire refers to any piece of jewelry with a single diamond. 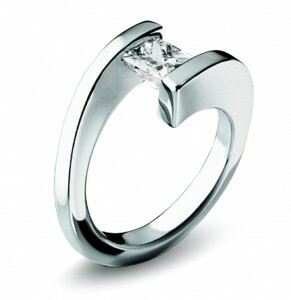 Diamond solitaires can be a ring, necklace, earring or even men’s jewelry. They have come to mark some of the most significant occasions in one’s life, like sweet-sixteen, anniversaries, and the most notable, an engagement proposal. A diamond engagement ring is a known symbol of lasting love and fidelity. When a man kneels and places the diamond ring onto his fiancée’s finger, it is a moment to be remembered forever. A woman may look at her engagement ring thousands of times over the course of her lifetime; for this reason, the ring ought to be expertly matched to the bride. Many engagement ring buyers choose a solitaire setting for its classic elegance and its ability to showcase the beauty of the stone. In fact, in a recent survey of over 7,000 engaged women, TheKnot, found that 25% had received solitaires. 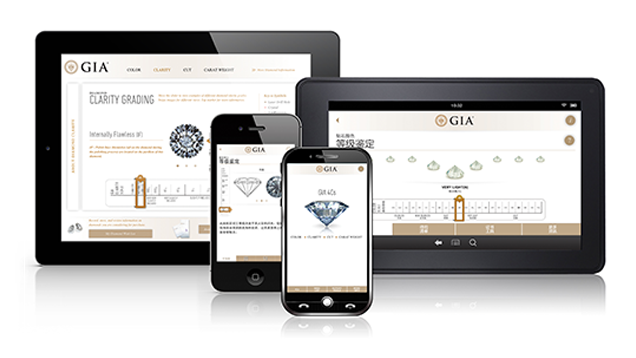 Within the solitaire category, there are many settings to consider when purchasing that perfect engagement ring. Since the diamond will be the centerpiece of the ring, most people begin the selection process with the shape of the diamond. The most popular stone shape for a solitaire ring is the round brilliant (53% of all engagement rings, according to TheKnot); this creative, multifaceted style is cut to sparkle and show off the depth of the stone. This cut is arguably the most brilliant of all solitaire choices because it provides the maximum amount of light return through the top of the diamond. Other popular styles for solitaire diamond rings are cushion, princess, radiant, and pear. Once the shape of the diamond is selected, buyers consider the best setting style for the stone. Although the first demand is practical–that it will be secure enough to hold the stone safely in place–there are many aesthetic concerns as well. 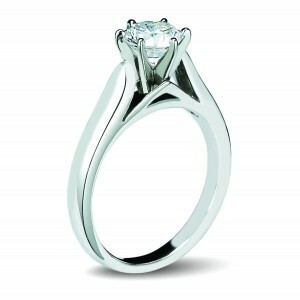 For solitaire rings, popular setting styles include prong, cathedral, bezel and tension. A prong setting is minimalist in nature, holding the stone like a claw from beneath. The prongs are small wires that bind the stone, welded to the band to ensure its safety. Yet they suspend the stone high enough off of the band to show its size and detail, offering maximum sparkle. The Tiffany 6-prong setting, introduced over 125 years ago, serves as the iconic image of an engagement ring. This look served to popularize the giving of diamond solitaire rings for engagements, and it remains a popular, and often imitated, style. 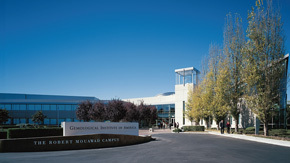 A cathedral setting allows the diamond to be visible, with slopes on either side to protect the stone. The cathedral setting gets its name from its aesthetic similarities to an old cathedral—its sweeping nature is reminiscent of the vaulted ceilings and pleasing arches of these places of prayer. A bezel setting is sleek and modern—the metal of the band is used to completely surround the diamond, following exactly the stone’s shape. This is an ideal choice for an active lifestyle. 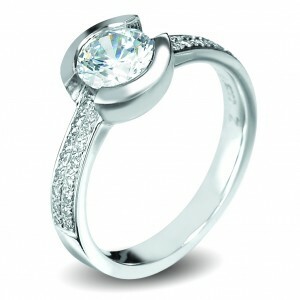 A tension setting allows the ring to act as a spring, holding the diamond in place. This setting type is known for its unique appearance, allowing the diamond to appear to be floating. Further, there is no metal underneath the diamond, which means the stone can be cleaned easily. Diamonds are natural grease magnets, so when dirty, they appear duller in appearance. No matter what stone shape and setting type are selected, a diamond solitaire ring is sure to please any bride-to-be, eliciting a smile from her lips each one of the million-plus times she glances at her ring in years to come.